Resources that I create or use can be downloaded below. FIRST LESSON BACK – Following a request, here is the powerpoint I used on the first day back after the summer holidays. I use it to explain my systems to the students. Below are the stickers I get students to pace on the cover (front and inside) of their exercise books. I also include the powerpoint templates that I used to edit the text to allow you to personalise the stickers for your own system. I just created them in powerpoint (provided underneath each sticker) and then copied them and pasted them into word as an image to preserve the formatting etc.. The stickers are formatted to AVERY A4 C2160 sticker type. Poster – Explaining RAG123 Student – This is the powerpoint I use when explaining to students the reasons I use #RAG123 to mark their books. #RAG123 Stickers Student – This is a basic student version. I couldn’t fit more than one line for each as it was too small to read. Poster RAG123 Student– This is the powerpoint I used to create the stickers, could also be displayed as a poster in class. This contains both my basic student version on the sticker above, and the more detailed student version. 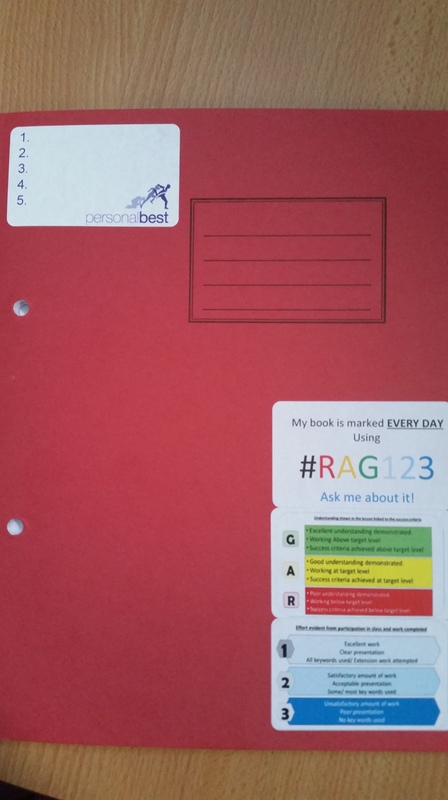 #RAG123 Stickers Teacher – I then realised I could use one sticker for the RAG and second for the 123! Will redo the above one at some point to be the same as this. Poster RAG123 Teacher – This is the powerpoint I used to create the stickers, could also be displayed as a poster in class. Poster – Levels Of Challenge – This is the powerpoint I used to create the levels of challenge stickers. DIRT Stickers – Students know what to do for DIRT, know that Mrs Browning’s DIRT is green but can never remember what it stands for! Poster – DIRT – This is the powerpoint I use to explain to students how DIRT works. Personal Best Stickers – Trying to encourage a growth mindset and get students competing with the only person that matters – themselves! Students record their best exam/ test result and aim to beat this everytime they do a test (even if it is by 1 mark or percentage point). 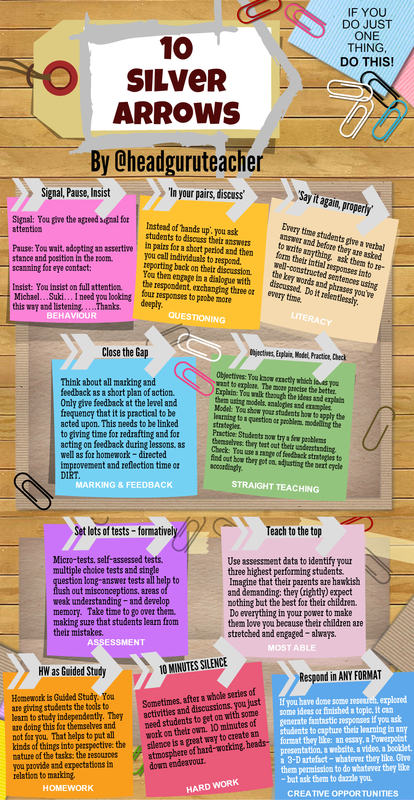 This is a poster I created using picktochart to support my year team in marking their PSHEE books. 10 Silver Arrows – pdf version of the above. It is slightly bigger than A4 but it can be printed out, stuck together and then laminated.